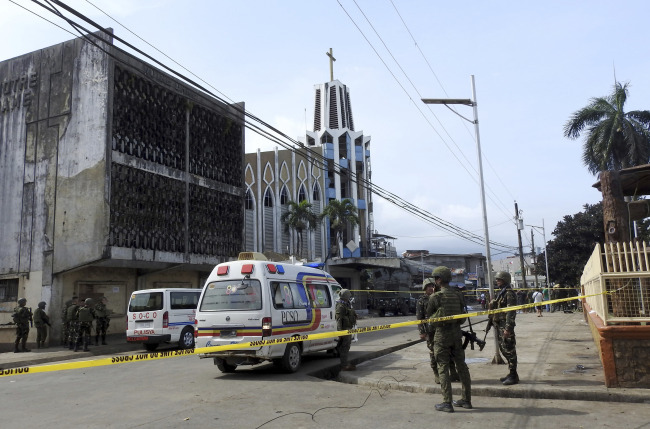 JOLO, Philippines (AP) – Two bombs minutes apart tore through a Roman Catholic cathedral on a southern Philippine island where Muslim militants are active, killing at least 20 people and wounding 111 others during a Sunday Mass, officials said. ``I have directed our troops to heighten their alert level, secure all places of worships and public places at once, and initiate pro-active security measures to thwart hostile plans,'' said Defense Secretary Delfin Lorenzana in a statement. ``We will pursue to the ends of the earth the ruthless perpetrators behind this dastardly crime until every killer is brought to justice and put behind bars. The law will give them no mercy,'' the office of President Rodrigo Duterte said in Manila. Abu Sayyaf militants are still holding at least five hostages _ a Dutch national, two Malaysians, an Indonesian and a Filipino _ in their jungle bases mostly near Sulu's Patikul town, not far from Jolo.